More Proof Emerging Time Is Short - Full Impact Of Growing Collapse Slams Railroads, Freight Transportation Industries - Is This The 'Tsunami' That's Coming To America? 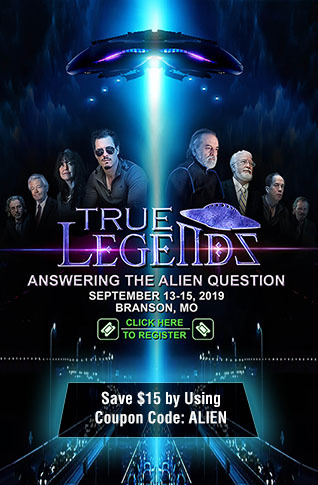 The new SQAlerts on Steve Quayle's website are quite telling and more signs that the anticipated collapse of the global economy is right on schedule but the real terror is still to come. The railroads in America have long been a tell-tale sign of how the overall economy is doing and as we learn within these alerts and this story from Wolf Street, our freight transportation industries are now feeling the burdens of a weakening economy. With a deep 'freight recession' hitting railroads, trucking and air freight, how long will it be before the rest of the nation feels the coming impact of collapse like an onrushing, deadly tsunami as shared in this linked story? Within these alerts we learn that two large terminals were recently shut down in Erwin, Tennessee and Corbin, Kentucky, causing the loss of hundreds and hundreds of jobs and facts that we can easily verify ourselves here and here. The shut down in Erwin, Tennessee was after 140+ years of continuous service - 140+ years! That takes us all the way back to the mid-1870's! What has changed in America in the last few months and years that has caused this loss, after 140 years of continuous service? The answers are clear. Several videos below these SQAlerts including an X22Report that takes a look at the 'economic recovery illusion' that is now falling apart as more and more and more Americans lose their jobs as well as the 2nd video which takes a look at the global trade collapse and the collapsing Baltic Dry Index and what that means for the global economy. These alerts help to tell a story that the mainstream media isn't telling...a story of coming collapse that Americans need to know if we're going to stand a fighting chance at survival. I have been with this RR since 04' and learned that the RR feels the burden of the economy before the rest of the nation. Always watch the RR. STEVE, IN REGARD TO THE RAILROAD ARTICLE, THIS IS A COMMENT FROM A FRIEND. I HAD HIM REMOVE HIS CREDENTIALS, SORRY, BUT I HAD TO. The last two years which were booming, and being so they hired a bunch of conductors and ordered 300 new. There are 9 divisions in my RR, where there were 10 just a month ago. They shut down two large terminals there Erwin, TN and Corbin, KY and then had the surrounding divisions absorb what was left. That division's [the Huntington Division] main freight was coal. We are all obviously aware of the furloughs and their deepening situation. The official told us about how we unfortunately ordered all of those locomotives and need to pay for them because of the contract with GE. In my terminal alone we have approx. 50 mothballed engines (our term for locomotives) and I know they are everywhere.... I have been with this RR since 04' and learned that the RR feels the burden of the economy before the rest of the nation. Always watch the RR. With regard to the train freight article this morning, we have in Grand Junction, CO., literally hundreds of engines sidelined on the tracks. They are three deep on some tracks and easily number over 250. I have never seen this many engines on the tracks before and I feel this is just another indicator of the slowdown in shipping. I will get a video and send it to you for your archives. God bless. Time is short. More of the signs that we are seeing around us of massive change happening now include in Norway, where we learn that the country's biggest bank is demanding a ban on cash, just the latest step we're now witnessing in the 'war on cash'. A little bit closer to home for most ANP readers, Canada is dealing with a major price spike in food, fruits and vegetables in particular, where we learn from Zero Hedge that "if Canadians insist upon eating tomatoes, they're going to have to pay for it." While growing their own tomato plants would be a permanent way to end that potential problem, we learn that fresh fruit has skyrocketed 12.4% since 2014 while fresh vegetables are up 14.4%. A couple days ago on SHTFPlan, Jeremiah Johnson told us 'the world is about to enter a global depression unlike anything seen before'. We're told that warfare and martial law may be what inevitably accompanies this global depression as the collapse is now in a 'forced free fall' we see happening before our very eyes. Almost every society that has collapsed has seen such a fall heralded by severe economic turmoil. We are seeing such turmoil in the freefall of the U.S. economy and, from a bigger picture, the world economy. The world is about to enter into a period of global depression unlike anything seen before, and the necessary element to cement such a depression will soon be present: the element of war. With that element present the final link will have arrived in Obama’s grand plan to enslave the citizenry completely and destroy the U.S. Warfare is necessary to provide the justification needed for the administration to declare martial law. Little by little Obama has been chipping away at every cornerstone of the foundations of American society. He originally had both houses of Congress, and now he’s down to just one; however, his actions have not abated. If anything they’ve increased, especially in rapidity as he has (we hope!) only a year left. In the 1st video below from the X22 Report Dave takes a look at many of the different signs that we're now seeing that are proving to the American people that any economic recovery was merely an illusion as economic reality hits Americans squarely in our faces. 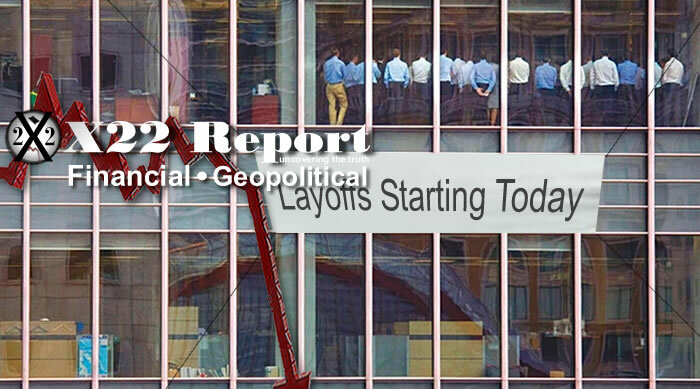 Dave also takes a look at what is going on economically around the world, from South America to Europe to the Middle East as banks and industries are struggling and the worlds people can either prepare for what is coming or be buried in the coming landslide. In the event that you have been looking for the following major worldwide financial downturn, you can now quit holding up, in light of the fact that it has formally arrived. At no other time in history has worldwide exchange caved in this significantly outside of a noteworthy overall retreat. Obviously something huge is going on, and it is influencing the whole planet. The CEO of the biggest delivery organization on the planet trusts that the clarification for what is occurring is genuinely basic. In the event that you suspected that the money related shaking that happened in late August was terrible, actually it was nothing contrasted with what is currently traveling our direction. 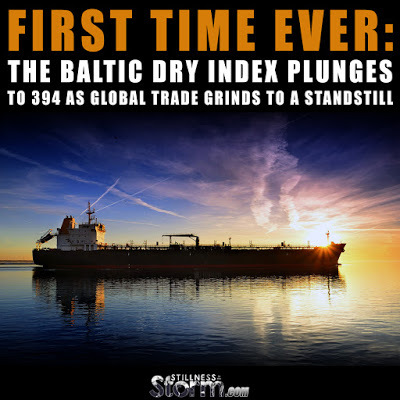 Keep in mind, the Baltic Dry Index is no longer at 394; as we can see below in the graphic from Bloomberg, it now sits at 354. 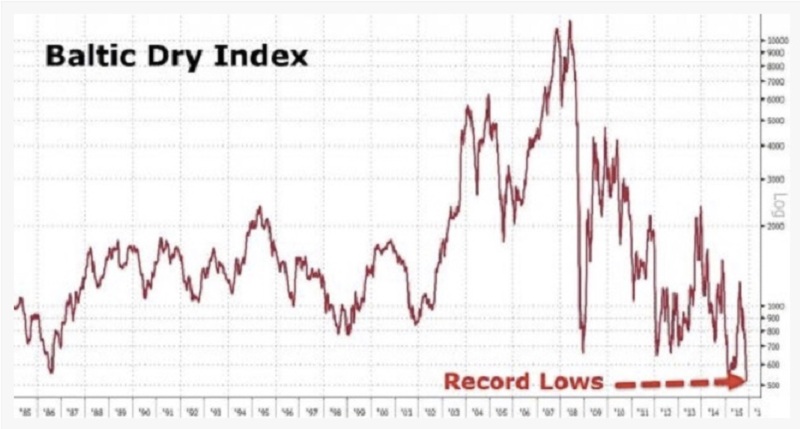 How low can it go? Most Americans don't understand how all of this will one day play into our every day lives. BioPrepper gives us an excellent idea in this linked story.